With profound sadness, we announce the passing of James David Goldston Jr., our loving and devoted “Daddy”, “Granddaddy” and “Great-Granddaddy.” Surrounded by family, Jimmy passed peacefully Sunday, February 10, 2019 at Rex Hospital after a short battle with Acute Leukemia. He was 85-years-old. The son of David and Margie Goldston, Jimmy was born September 8, 1933. 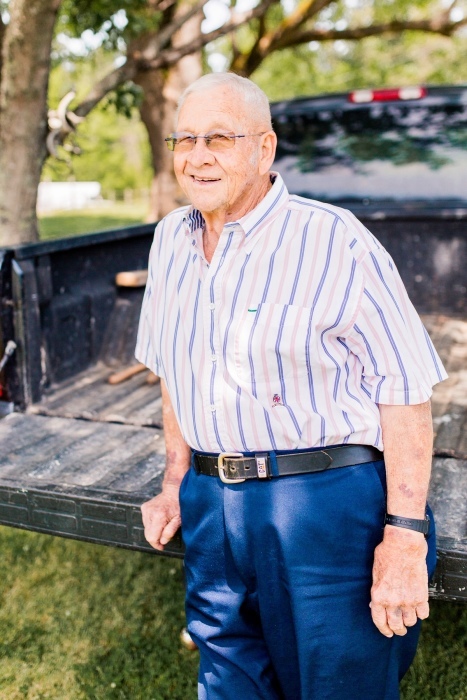 Jimmy took much pride and pleasure in working at Goldston Lumber Company, his father’s lumber mill. Between school and work, he found time to fall in love. At 16, he and his sweetheart, Louise Freeman, eloped to Dillon, SC and enjoyed 66 years of marriage prior to Louise’s passing in 2017. He went on to start his own business, Goldston Well Drilling, which he operated until he sold out in 2001. He then focused on his true passion of real estate. He loved land and was always looking for a deal. He was a man of his word who had many friends that admired him and valued his opinion. Jimmy is survived by his two siblings: Dr. William Goldston and Doris Miller. He was blessed with four children: Jim Goldston and wife Agnes; Cindy Daniel and husband Richard; Margie Kidd and husband Wayne; Lee Ann Kelley and husband Rusty. Also seven grandchildren: Molly Goldston, Sarah Bryant, Dustin Daniel, Cameron Kidd, Katie Kidd, Megan Kelley, and Cody Kelley. Granddaddy is also survived by eight great-grandchildren, soon to be nine. He was so proud of his family and loved them deeply. A service to celebrate Jimmy’s life will be held on Thursday, February 14, 2019 at 1 PM at Wakeminster Baptist Church, 13221 Old Creedmoor Road, Raleigh, with Chaplain Jim Dyer officiating. Entombment will follow at Brier Creek Memorial Gardens in Raleigh. The Goldston family would like to extend our heartfelt gratitude to the many special caregivers from Rex Cancer Center of Wakefield. Flowers are appreciated or memorial contributions may be made in his honor and memory to the Baptist Children’s Homes of NC, P.O. Box 338, Thomasville, NC 27360.